Kublai Khan (1215-1294) - Upon his death, Genghis Khan left a legacy of conquest and destruction; but he also left a long line of successors who followed in his footsteps. His grandson, Kublai Khan, is his most famous descendant. And while he could display the same cruelty as his grandfather, he was also perhaps the most enlightened of the Mongol rulers. Kublai was about 12 years old when Genghis died, and the only recorded event that involved the two of them was a hunting trip in 1224 for Kublai's older brother, Möngke. It was a rite of passage hunt and Genghis, in accordance with Mongol tradition, rubbed fat from one of the animals onto the fingers of the two brothers. As an adult, Kublai would succeed Möngke as Khagan ("Great Khan"), but had to battle his younger brother, Ariq Böke, for power. Upon Möngke's death, Ariq Böke secured the support of most of the family at the Kurultai (Mongol Great Council), but the fourth brother, Hulagu, opposed Ariq Böke and threw his support behind Kublai. The conflict is called the Toluid Civil War (named after their father, Tolui, who was Genghis' youngest son). Fought from 1260 to 1264, it ended in victory for Kublai. Ariq Böke survived and was pardoned (although he died in 1266). We'll never know if Hulagu planned to make his own play for power because he himself died in early 1265 shortly after the war ended. The civil war was costly in that it began the fracture of the empire into smaller kingdoms. Also, the Mongolian capital, Karakorum was destroyed. Perhaps it was these factors which led Kublai Khan to concentrate his power in China. Although the Mongols controlled Northern China since the days of Genghis Khan, Kublai chose to rule only China in 1271 when he established the Yuan Dynasty. He made his capital Dadu (modern-day Beijing), but had a summer palace at Shangdu (Xanadu in English). 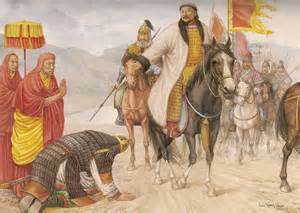 In 1273 he unified all of China under his rule when he overthrew the Song Dynasty with the Fall of Xiangyang. As a Mongol, he would become the first outsider to rule China as emperor. Nonetheless, he did not rule as a Mongol, but kept the Chinese system in place, both political and cultural. As emperor, Kublai was interested in the many different faiths which extended throughout the Mongol Empire. He was especially receptive to Buddhism and may have been Buddhist. But he also had several Muslims serving in his court. He was also well versed in Taoism and Confucianism. Finally, when Marco Polo's father and uncle came to China in 1266, he sent them back to Europe with the request that they return with Christian monks who could teach him about Christianity (which they did - see Marco Polo). On the economic front, Kublai rebuilt the Grand Canal to improve commerce within the empire. He also introduced the first universal paper currency in China's history. The problem is that it was over issued which resulted in terrible inflation. Kublai Khan remedied the situation by confiscating gold and silver from citizens and merchants to stabilize the currency. He engaged in several military campaigns, most famously against Japan (see Mongols invade Japan below). As an interesting historical note, Kublai Khan owes much of his fame to the book about Marco Polo's travels. It introduced the Western World to the Great Khan. He would be reintroduced several centuries later in a poem titled Kubla Khan by Samuel Taylor Coleridge.